First of all you need to download our Windows 10 – Signing Tool. To do so, please visit the link below. The tool is currently in beta (testing). So it may has bugs or some features aren’t available at the moment. If you find an issue, please report it over here. Thank you! In order to use our tool you need to download and install the Windows 10 Developer Kit. Once you’ve downloaded and installed the WDK, start the Windows 10 – Signing Tool and enter the installation path. If you have chosen the default installation path, the tool should find the WDK installation path automatically. Otherwise you can paste your custom path. If you haven’t chosen the default installation path, you either can copy the path in the text box or you can find the path while using the “Choose Path” button. Additionally you can download it by clicking the “Download” button. If the path is valid, the text box turns green. To be able to upload a windows program / game, it must be signed with a valid certificate. So we’ll start with creating a certificate first. In order to generate your own certificate (.pvk and .cer files), you need to enter your details at the “Personal Information” panel. Moreover add the target path and some additional information at the “Export and Certificate Options” panel. Those data are needed in order to create your certificate. The program will only save your information on your local machine. We will not share or save any information. 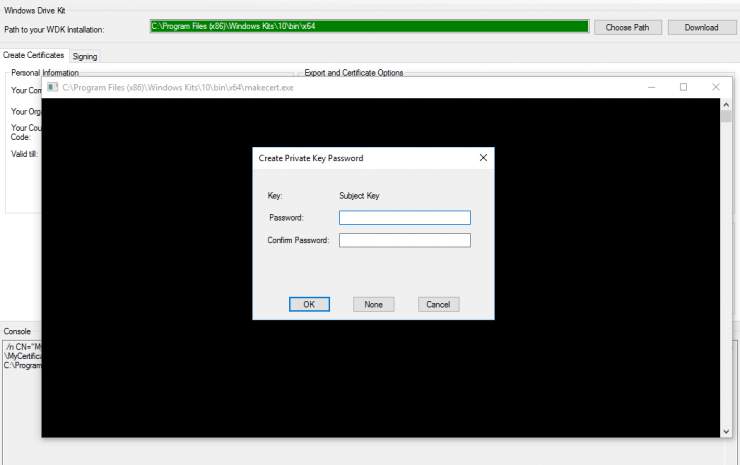 When you feel ready click the “Create Certificate” button at step “1) Create your certificates”. 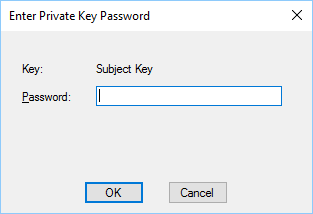 This will open a CMD window and prompt you to enter a password. Please note your password! You will need it later for signing your application. Once your password is lost, you cannot sign updates for an exisiting and released project. So keep it carefully. If all went well, you will get following message. Now we need to merge our .pvk and .cer file to a .pfx file. To do this, click the “Create PFX File” button at step “2)”. The tool will open a file dialog. Select the .pvk and .cer files and enter the password (the one you set at the creation of the certificate). You also will get a notification if all went well. Now you can open the epxort folder, for instance by clicking the “Open Target Path” button. There you’ll find your fancy certificate. This feature is implemented, yet hasn’t been tested.